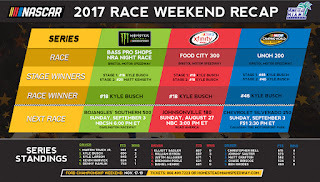 · Kyle Busch won the 57th annual Monster Energy NASCAR Cup Series (MENCS) Bass Pro Shops NRA Night Race at Bristol Motor Speedway Saturday night. It is Busch’s 40th win in 450 career MENCS races. · Busch complete the sweep at Bristol, winning the XFINITY Series race on Friday and the Camping World Truck Series race on Wednesday. This is the second time Busch sweeps a Bristol race weekend (2010) – the only driver to ever do so. · It is Busch’s second victory and 14th top-10 finish in 2017, and his sixth victory and 14th top-10 finish in 25 races at Bristol Motor Speedway. · Erik Jones (second) was the highest finishing rookie, posting a career-best finish in the Monster Energy Series. It is his third top-5 finish in 2017, and his second in a row. It is also his first top-10 finish in two races at Bristol Motor Speedway. · Denny Hamlin (third) posted his 12th top-10 finish in 24 races at Bristol Motor Speedway. It is his ninth top-5 finish this season. · Busch won Stage 1 of Saturday’s race, while Matt Kenseth won Stage 2. · Martin Truex Jr. (951) leads the 2017 point standings by 101 points over Kyle Busch (850). They are followed by Kyle Larson (845) and Kevin Harvick (824). · In 12 career MENCS starts at Homestead-Miami Speedway, Busch has had five top-10 finishes, including a victory in the 2015 Ford EcoBoost 400 as he captured the first Monster Energy Series championship of his career. · Kyle Busch won the 36th annual Food City 300 at Bristol Motor Speedway Friday night. It is Busch’s 91st win in 337 career XFINITY Series starts. It is also his fifth victory and eighth top-10 finish in 2017. · It is Busch’s ninth victory and 20th top-10 finish in 25 races at Bristol Motor Speedway. · Daniel Suarez (second) posted his fifth top-10 finish in six races at Bristol Motor Speedway. It is his sixth top-10 finish in 2017. · Elliott Sadler (third) posted his 11th top-10 finish in 22 races at Bristol Motor Speedway. · Daniel Hemric (seventh) was the highest finish rookie. · Elliott Sadler (807) leads the XFINITY Series points standings by 110 points over rookie William Byron (697). They are followed by Justin Allgaier (671). · Kyle Busch won the 20th annual UNOH 200 NASCAR Camping World Truck Series race Wednesday night at Bristol Motor Speedway. It is his 49th victory in 140 Camping World Truck Series starts. It is also his third victory and fifth top-10 finish in 2017. · It is Busch’s fifth victory and eighth top-10 finish in 11 races at Bristol Motor Speedway. · Matt Crafton (second) posted his ninth top-10 finish in 15 races at Bristol Motor Speedway. It is his 10th top-10 finish in 2017. · John H. Nemechek (third) posted his fourth top-10 finish in four races at Bristol Motor Speedway. · Christopher Bell (615) leads the points standings by 42 points over Johnny Sauter (573). Two-time series champion Matt Crafton has compiled 562 and is third, while rookie Chase Briscoe is fourth with 534 points.